A dark humor pervades the halls of the Egyptian Initiative for Personal Rights, a leading local rights group headquartered in Cairo’s leafy Garden City district. Amid rows of tightly clustered desks, members rib each other about being out of a job soon or joke about taking pictures of the office to preserve the memories of their work there. Yet beneath the jocularity lies a palpable sense of foreboding. Civil society groups across Egypt are braced for a crackdown in the wake of a November 10 government deadline to submit to regulations that give the state tight control over their activities and fundraising or face penalties that include up to a year in prison. A resurgent authoritarianism under the rule of President Abdel Fattah al-Sisi has left dissident activists and opposition groups feeling cornered, with little room to maneuver. Security forces have killed hundreds of demonstrators and jailed thousands more, many of them supporters of the Muslim Brotherhood. Leading revolutionaries are locked up. A sense of malaise plagues activist circles, with energies largely spent on supporting and advocating for the thousands of people in prison, most of them young. Street demonstrations—once a vibrant and effective political tool—have been shut down by police violence and a draconian protest law. The airwaves are dominated by pro-regime figures who demonize any critical voices, while journalists have been beaten, arrested and, in one high-profile case, sentenced to years in prison on terrorism charges. Now, human rights groups feel their time has come. In July, the government announced a deadline for all civil society groups to officially register under a restrictive Mubarak-era law. Law 84 of 2002 gives the state sweeping authority over staffing decisions, activities and funding. Under the Mubarak regime, many independent NGOs chose to register as companies or law firms to avoid the law’s restrictions. While they faced intimidation, censorship and occasional arrests, their existence was largely tolerated. Human rights defenders say that era has come to an end. A further cause for alarm was Sisi’s move last month to amend Article 78 of the penal code to impose a life sentence against anyone who requests or receives foreign funding with the intention of “harming national interests” or commits acts that “breach the country’s independence, or unity”—vague language that NGOs, particularly human rights groups, fear could be used against them. After Mubarak’s ouster, groups like EIPR flourished, gaining access to funding from abroad to hire some of the best and brightest local rights advocates and lawyers. EIPR tripled in size, going from two dozen employees in 2011 to more than seventy-five. The new, broad phrasing in Article 78 means that the group will have to forgo any foreign funding in the future, Abdel Razek says, as the pool of resources available for rights advocacy is drained by the regime. Earlier this month, al-Mawred al-Thaqafy (Culture Resource), a successful organization supporting artists and cultural activities, announced it was ending all operations in Egypt. It did not provide a reason behind its decision, saying only that it “hopes the conditions will change to allow resuming its activities in Egypt as soon as possible.” Yet the timing of the announcement prompted many to point to the state noose tightening around civil society. Successive governments since Mubarak’s overthrow in 2011 have sought to introduce new legislation regulating NGOs to replace Law 84. In June, a draft appeared that alarmed rights groups for allowing security agencies even greater powers to oversee the fundraising and activities of civil society and imposing harsher penalties for non-compliance. Fears of an impending crackdown were further stoked by Sisi’s appointment of Faiza Aboul Naga, a Mubarak-era stalwart, as his national security adviser. At the end of 2011, as a cabinet minister in the military-led transitional government, Aboul Naga spearheaded a campaign against NGOs in which the government not only raided and shut down ten Egyptian and American organizations but issued arrest warrants, sparking a crisis with Washington. Yet groups that work to shine a spotlight on government wrongdoing, documenting abuses like police brutality and corruption, feel they are now in the crosshairs. 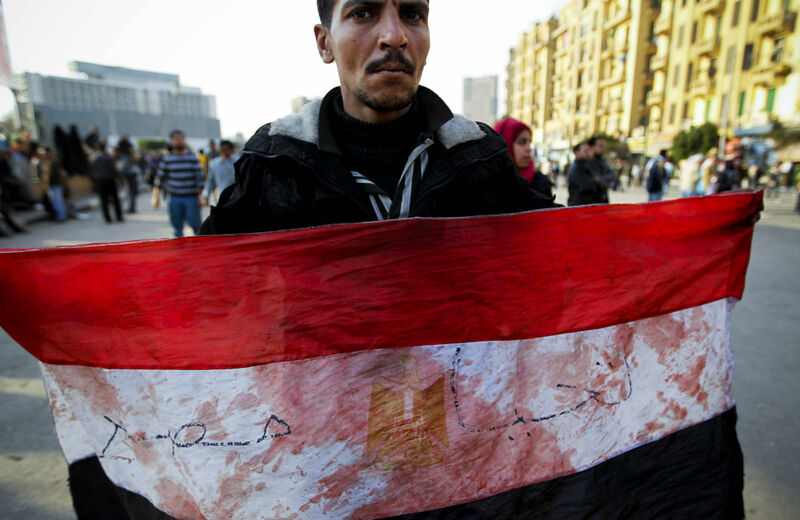 Human rights defenders have been the target of a vilification campaign by state and private media, which continually portray them as disloyal Egyptians doing the bidding of outside forces to undermine the regime and tarnish the country’s reputation. In August, authorities for the first time barred two senior executives from Human Rights Watch from entering the country to unveil a year-long investigation of mass killings of demonstrators at the hands of security forces. Since then, the rising intimidation, bolstered by whispers of impending arrests, has forced several of Egypt’s leading rights advocates to leave the country. One prominent human rights defender who recently left for the United States explained his decision: “On the one hand, there was the overt and covert threats, and on the other hand, there was the suffocating environment of this shrinking space for any kind of dissent.” Once a frequent guest on television discussing rights issues and revolutionary aspirations, he is now in exile and does not know when he can return. “Not knowing whether you can leave, whether you can go back, whether you can be in Egypt is I think the worst part, and I don’t think it’s a coincidence or side effect. I think it’s part of the plan. It has a chilling effect, and it leads to everyone living under a constant threat to one’s safety and freedom,” he says. A case in point is Yara Sallam. A 28-year-old lawyer working with EIPR, she was among two dozen people arrested in June after security forces dispersed a demonstration in eastern Cairo against the controversial protest law. In custody, Sallam was questioned about the nature of her work and about EIPR’s management. She was subsequently charged with violating the protest law while her cousin, who was arrested beside her in exactly the same circumstances, was released hours later without charge. EIPR’s Abdel Razek has no doubt that the authorities decided to hold Sallam because of her human rights work. Last month, she and twenty-two co-defendants were sentenced to three years in prison. The current generation of advocacy organizations in Egypt was established in the mid-1980s and grew throughout the next two decades into arguably the most mature human rights community in the region, with high degrees of specialization and expertise. The increasingly hostile climate for NGOs has taken a toll. Earlier this month, seven local rights groups decided not to take part in a United Nations review of Egypt’s human rights record in Geneva, saying they feared persecution by authorities upon their return. The government has justified the raft of new decrees and regulations, including the NGO measures, as necessary to combat a growing Islamist insurgency that has carried out scores of deadly attacks on army and security forces in the Sinai Peninsula as well as the capital and Nile Delta. At least six international and around ten local organizations filed paperwork ahead of the deadline to register under the 2002 law, according to the ministry. Mohamed Lotfy, head of the Egyptian Commission for Rights and Freedoms, an organization founded last year, reluctantly decided to register his group in order to provide some legal protection for members and volunteers.